Computer Literacy: Issues and Directions for 1985 is based on a conference entitled "National Goals for Computer Literacy in 1985", held in Reston, Virginia, on December 18-20, 1980, under the auspices of the National Science Foundation. The conference provided a forum for discussing views on computer literacy, as well as methods for infusion of computer-related objectives and activities into existing curricula for different age levels. Issues and barriers to developing national goals for achieving a computer-literate society in the United States are also examined. 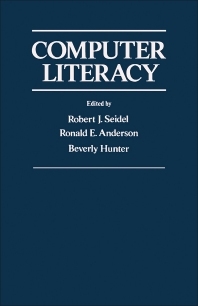 Comprised of 31 chapters, this book begins by presenting four major approaches to a perspective on computer literacy: impact of computer literacy on the citizenry; major national components of a computer literacy program; development of an information handling curriculum for an evolving computer literacy concept; and a 30-year historical overview of "computer events in three strands" (research/development/technology, education, and social/political institutional). The next section considers the definitions and requirements of computer literacy as they impact society, students, and teachers. The use of the computer in cognitive research and in problem solving is also discussed, together with curriculum development in computer literacy. This monograph will be of interest to students, teachers, school administrators, and educational policymakers.